The management of companies seems to change rapidly today. More and more companies are forced to seek mergers during these continually troubled economic times. Naturally, successful managers need to make sure that a given company is going to be worth their while in the first place, and they are going to need to know how much a company is going to cost them. The enterprise values of these companies can help them make informed decisions. In this article, some of the fundamental calculations and considerations behind the buying and selling of companies is going to be discussed. In the event that a company is going to be purchased, the takeover price is the enterprise value. Since the current stock price often refers to the market value of something, the enterprise stock price and enterprise value of a given company will often be used interchangeably. 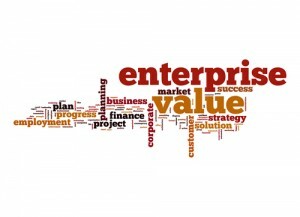 How should the enterprise value be calculated? To calculate the enterprise value of a given company, it is important to add the market value of the common stock, the market value of the preferred equity, the minority interest, and the market value of the company’s debt. Then, subtract the value of the company’s cash and investments. From there, an accurate figure that will represent a given company’s enterprise value will appear. How should the equity value be calculated? Prospective buyers or sellers will need to know how to calculate equity value before they calculate the enterprise value. To calculate the equity value of a given company, multiply the value of the outstanding common shares and the market share price. How is the enterprise value different from market capitalization? The enterprise value of a company is a much more modern measurement, and it is considered to be far more accurate than the market capitalization value. While both measurements reflect the market value of a given company, the enterprise value of a company takes its debts into account. Parties that purchase companies acquire their debts. Plenty of companies take in high streams of revenue, but they are in so much debt that their actual profits are low. These sorts of companies are more likely to seek out new buyers in the first place,so prospective buyers are going to run into situations like these frequently. How can people perform the net debt calculation for a company? It’s important to learn about the net debt calculation for a company before anyone can derive a sense of the value of that company. The net debt of a company is calculated by adding the short term debt and the long term debt, and then subtracting the cash and cash equivalents for that company. How can anyone learn more about these calculations and this financial situation? Khan Academy Investing is a great source for the people who are interested in learning more about this process from home. No one needs to go to business school in order to learn about this sort of thing in the modern world. Understanding the financial state of a company can be challenging. It is important to understand the situation in all of its many facets. The enterprise value of a company is going to paint a much more accurate picture of the company’s financial state than the market capitalization, although many people will still use the market capitalization value first. When people understand the enterprise value of a given company, they will be able to make informed decisions when it comes to whether or not to purchase that company.